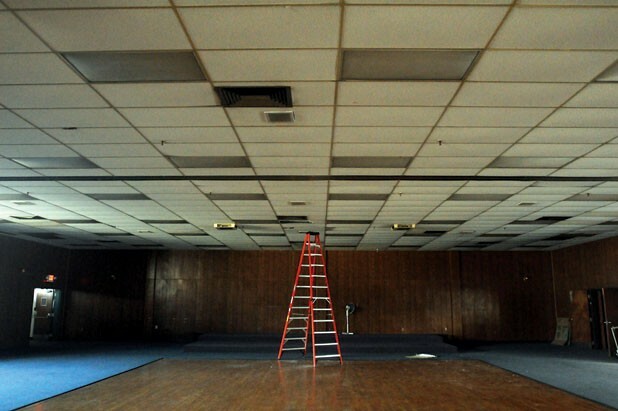 The only sign of activity inside the former American Legion Hall in White River Junction is the low hum of the high-tech, ultraefficient heating system, which sits incongruously amid blackened cast-iron furnaces in the back room of the gutted building. Still, you can sense the presence of the fraternal occupants who only recently vacated the premises. Dark, glistening grease coats various kitchen fixtures, and the funky reek of thousands of smoked cigarettes is so thick you can feel it on your tongue. As he leads a tour through this boxy, midcentury building just south of the modest but busy downtown, real estate developer Matt Bucy, 50, acknowledges with a chuckle that the place requires a bit more work than does the standard fixer-upper. But the scale of this renovation project, which will extend the reach of the downtown commercial district by nearly two blocks, doesn’t seem to faze Bucy. He purchased the 22,500-square-foot property about a year ago, for $600,000; it’s his fourth major renovation project in White River in the past 20 years. Each of those projects followed a similar plan: Bucy purchased a tired old building whose decrepitude evoked White River’s long-lost industrial glory days. For tenants, he courted commercial and fine artists, thereby becoming one of several local trendsetters to lay down a new path for the village’s future. White River would no longer be a depressed, rough-and-tumble mill town but a nexus of Vermont’s creative economy. Which is not to say that the village couldn’t or wouldn’t hang on to certain elements from its colorful past. The denizens of White River have embraced the changes wrought by Bucy’s improvements. It’s hard to find anyone who isn’t enthusiastic about this major transformation, and it would probably be impossible to find someone who doesn’t like Matt Bucy himself, a tall, amiable man with an easy laugh. Bucy may be the central and currently most active figure in White River’s turnabout, but he’s not the only one. He has picked up a gauntlet thrown down by an earlier generation of residents who long sought to make their village a more pleasant place to live and work. To understand what White River is and will be, it’s necessary to understand what it once was. White River Junction's railyard. Photo by Sarah Priestap. The river that runs through this small village is white in name only (except in the winter), but the last word of the town’s name could hardly be more apropos. The past, present and future of this village — home to fewer than 3000 Vermonters — have been irrevocably shaped by the forces of confluence. First there were the rivers — the reason that the village exists at all. The settlement was originally built at the site where the White River, on its way southeast from the mountains, joins up with the Connecticut River. Once a few bridges were constructed there in the early 19th century, the place became an ideal site for a trading post. Then came the railroads. Between 1847 and 1875, developers brought no fewer than five railroad lines through the small settlement, thereby swelling the village’s population, the size of its commercial district and its wealth. These were the boom years, and they barreled into town by rail. The Central Vermont Railway and the Connecticut River Railroad arrived in 1847; the Connecticut and Passumpsic Rivers Railroad and the Northern New Hampshire Railroad came through town in 1848 and 1849, respectively; and the short-lived 14-mile Woodstock Railway was finally completed in 1875. These lines made the village into a hub of intra- and interstate commerce. The downtown — with its hotels, depots, saloons and, later, textile mills, bakeries and factories — owes its very existence to the railroad. Finally, there were the roads. Now known to motorists as the point where Interstates 89 and 91 meet — a conjunction made possible by construction crews in 1969 — White River Junction is also the place where the east-west U.S. Route 4 intersects the north-south U.S. Route 5. If you’re driving across eastern Vermont from almost any direction, on almost any road, you have to make an effort to avoid passing through White River. The meeting of the highways was a boon to big-box retailers and chain restaurants, which flourished just across the river in tax-free New Hampshire. It also helped hotel chains, which opened locations just off the highway in White River. 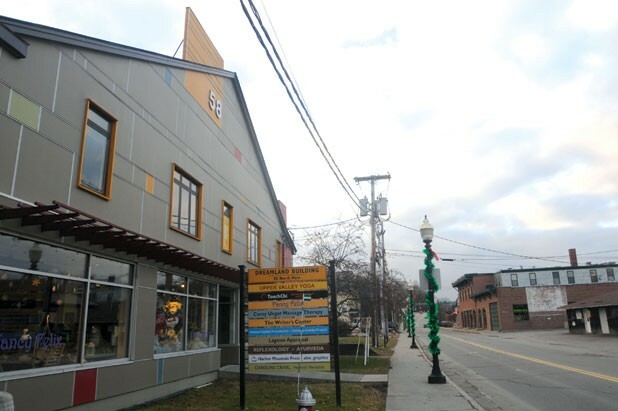 But that growth occurred a mile or more from the Junction’s village core, and few tourists or commercial truck drivers visited the village center. The railroads brought the boom, and the highways brought the bust. As less and less vehicular and commercial traffic found its way downtown, factories, warehouses and mills shut their doors, leaving hulking buildings to a decades-long period of decay. The sucker punch came when the railroads themselves fell into decline. By the 1970s, semis were hauling much of the cargo that had once filled freight trains, leading some of the rail lines to discontinue service to White River altogether. The interstate interchange is the most recent of the village’s historic convergences, and the last that could be charted by mapmakers and surveyors. But there’s another, less measurable convergence that has given just as much definition to White River Junction. It’s more of a creative and even emotional one, but no less real. In recent years, the town’s blue-collar identity has converged with the so-called creative economy. It’s impossible to discuss the renewal of White River without referring to Northern Stage and the Center for Cartoon Studies. This small village is home to both a professional regional theater company and an internationally renowned school of graphic arts — a claim that few, if any, similar-size towns could ever hope to make. More than any others, these two entities embody the notion of White River’s creative economy. Not only do both Northern Stage and CCS employ artists, but, in attracting patrons of the arts to the town, their very presence stimulates the local economy, inspiring visitors to take in a meal before the show, a cup of coffee after the exhibit, local shopping while in town for the weekend. Were it not for the artsy vibe that Northern Stage and CCS bring to White River Junction, there would likely have been no influx of other artists setting up shop there. 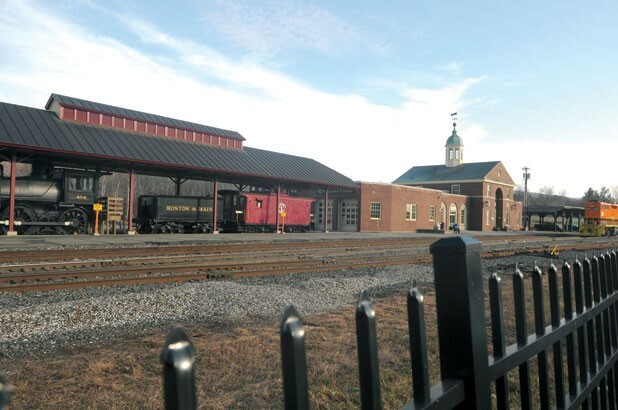 In White River Junction, past, present, future, art and commerce are hitched to each other like so many train cars. And, at the moment, Matt Bucy is operating the switchyard. Interior of the Tip Top building. Photo by Sarah Priestap. He financed the purchase and renovation of the building by maxing out six credit cards, and, studied the fundamentals of construction so he could do it himself. Prospective tenants started calling him up before he even formally owned the building. Bucy’s father, appalled by his son’s use of credit cards to finance real estate development, stepped in to help him out financially; along the way, Bucy taught himself everything he needed to know about finance. “I think I ended up with a better understanding of all that stuff than my father,” he says. With the debt paid off and all 10 of the building’s artists’ spaces rented, Bucy moved on to his next project: a complex on North Main Street that had housed a variety of commercial bakeries since the 1880s. After charting out a series of financial projections on the property, Bucy was convinced it was a sound investment. Upon purchasing it, he decided to renovate the exterior first, thereby establishing the property’s curb appeal. Bucy held an open house at the property in December 2001, not expecting much response. “Seven hundred people showed up. It was crazy,” he says. That very day, Bucy chalk-marked the floors of the Tip Top Media and Arts Building, as it has since been rechristened, to demarcate the layouts of its rental spaces. The whole place was rented out within three weeks. It is still rented out, and to a diverse array of tenants. 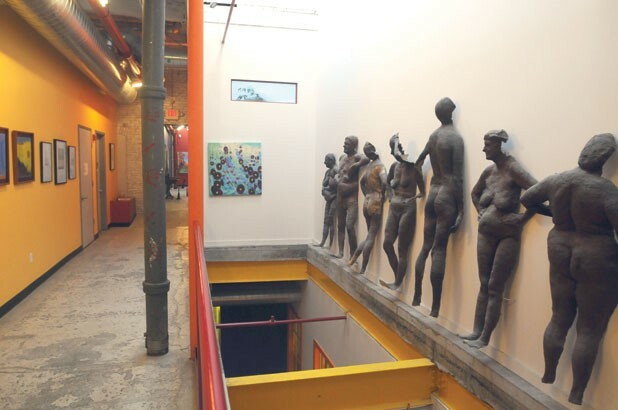 The Tip Top’s 41 spaces host, among others, a public-access TV station, a puppet maker, massage therapists, a ballet studio, and numerous painters and sculptors. Google rents a small space there, too — the odd one out amid all these nontraditional businesses; former state senator and nearby resident Matt Dunne is the company’s director of community affairs. Bucy’s own office is in the Tip Top, as well. The Tip Top is Bucy’s flagship project, and no visitor to White River can miss it. It’s anchored by the Tip Top Café, a well-regarded American bistro with a lively menu. Along with another restaurant, Elixir, just across the street from the Legion hall, the café is one of the local businesses that have helped White River transform itself from a “drive-by” town into a destination. Bucy’s next project, dubbed the Dreamland Building, was less ambitious in scale, but its occupants are equally varied: They include a yoga studio, a theatrical supply company and a writers’ workshop. Its parti-colored exterior quotes architectural elements from the buildings on either side of it, a design decision that suggests Bucy is sensitive to the village’s past. David Briggs has lived in White River Junction nearly all his life. The landlord and developer of several key properties here — including the Hotel Coolidge and the Briggs Opera House, where Northern Stage performs — he has for decades led the charge to remake his hometown. Briggs was one of several forward-thinking residents who, as early as the 1970s, introduced the concepts of “sprawl” and “downtown revitalization” into the conversation about White River’s future. For Briggs, one of the chief problems over the last century of White River’s economic history is that business owners had no connection to the village itself. They lived elsewhere, and, when their factories closed, they simply fired their employees, turned off the lights and left town. While the plans for the Legion building are not yet certain, Bucy is considering several nontraditional options, one of which is to turn part of the building’s first floor into a “coworker facility.” He envisions a central open space surrounded by small, glassed-in private offices, each of which could be rented on a short-term basis by, for instance, freelance writers or students at the cartoon school. The second floor would hold the 21 small apartments that Bucy estimates the space could support. Above that, on the 11,000-square-foot roof, he hopes to install solar panels. Those, along with extra insulation and the ultraefficient heating system, could enable the building to operate at near net-zero energy levels. Bucy hopes to complete the permitting process by February 2014 and to begin construction by March or April. He’s already fielding calls from construction companies that wish to bid on the project. The Dreamland Building. Photo by Sarah Priestap. Perhaps the cornerstone of that artistic community is the Main Street Museum, founded in 1992 by David Fairbanks Ford. Brimming with vintage ephemera, such as dog-chewed Frisbees, pop-culture detritus and fanciful taxidermy, the museum playfully challenges the very notion of what constitutes “proper” art. Ford was one of the first people to contact Bucy about securing studio space in the Hartford Woolen Mill. Soon after their meeting, the two began dating; as Ford puts it, “We were the only two gay men in town.” They were a couple until about 1997 and remain good friends. Ford is as enthusiastic as anyone about the last two decades of change in White River Junction, but he retains a fondness for the village’s past. “I kind of loved the town more [20 years ago],” he says, “because it was funkier and down and out.” He recalls a moment when he and Bucy, walking down South Main Street, heard a scream and looked up to see a television set flying out of a second-story window. “That’s local color,” he says. 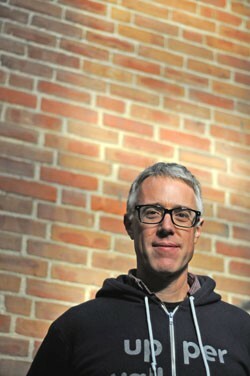 Ford, though an artist himself, is concerned that the creative economy may prove unsustainable. “Someone who is out of work and living in a crummy apartment — how do they benefit from [the local arts scene]?” he asks. He notes that local artists and artisans spend a lot of money in town: They help support restaurants, local shops and landlords. Yet, as artists, they are not likely to be on the path to great wealth. “We’ve got to figure out in our society how we’re going to fund people who are doing this work,” Ford says. Several local ventures may augur the convergence of White River’s artistic and business communities. One of these is Scavenger Gallery, a boutique operated by acclaimed jewelry designer Stacy Hopkins; another is Revolution, an upcycled-clothing store run by Kim Souza. Both businesses are right downtown, and both sell stylish, well-designed goods to customers with discerning eyes. Bucy has been out of town a lot lately, shooting a film project in Connecticut. With the help of his sole employee, Jacob Colby, and his ever-present iPhone, he keeps tabs on his business even when away from White River. One of his upcoming projects, in fact, demonstrates how Bucy himself embodies the convergence implicit in the term “creative economy.” In the months before the American Legion renovations get under way, Bucy will use the place as a soundstage for a planned web series about a young woman who is magically able to communicate across time with her grandfather — who just happens to be Andy Warhol. Even so, since Matt Bucy has been investing in it, there’s a great deal of the new in White River Junction. Inside White River Junction's American Legion Hall. Photo by Sarah Priestap. The original print version of this article was headlined "At the Crossroads"
Matt Bucy. Photo by Sarah Priestap.